The Gothic style parish church of St. Gregory's at the North Yorkshire market town of Bedale boasts an imposing fortified church tower which is said to be one of the best examples in northern England, the tower contains a ring of 8 bells, the earliest dating from fourteenth Century, traditionally said to come from Jervaulx Abbey. 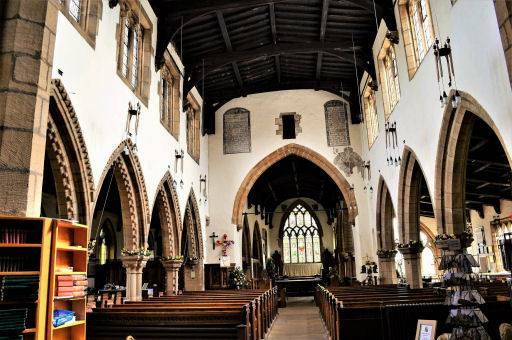 Few parish churches in England are dedicated to St. Gregory and Bedale is one of only two in Yorkshire, the other being at Kirkdale. 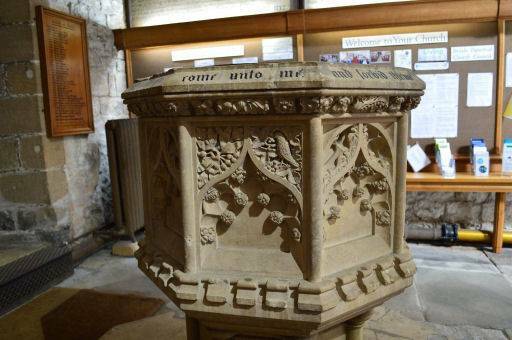 A church stood in Bedale at the time of the Domesday Survey of 1086, some elements of the saxon carving can still be seen in the crypt below the chancel as well as the nave. 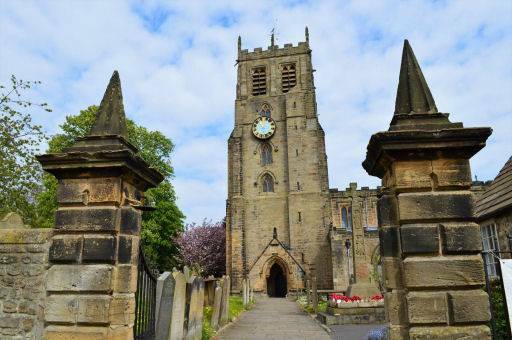 The present building displays architectural features of successive periods, including a fourteenth century south aisle and a fifteenth century tower. St. Gregory's was built to defend against Scottish invasion. 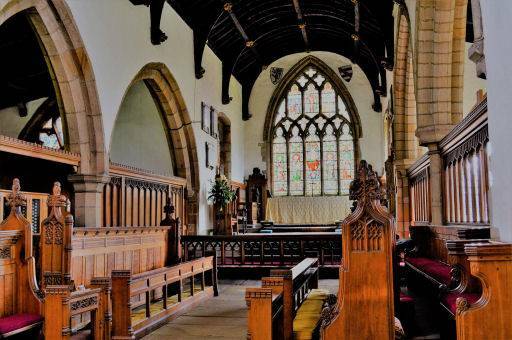 The entrance to the church through a porch to the tower once contained a portcullis, which was removed when it fell during a storm in the nineteenth Century, although the groove is still visible. The building retains some Catholic relics, although during the Civil War Puritans vandalised several features of the building. 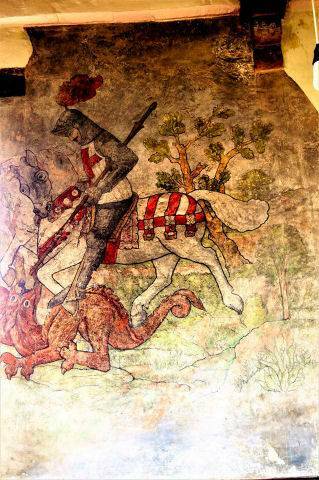 The church contains a handsome fourteenth century restored wall painting of St George slaying the dragon, in which, unusually, St. George is depicted as left handed. The painting is situated immediately opposite the south door. 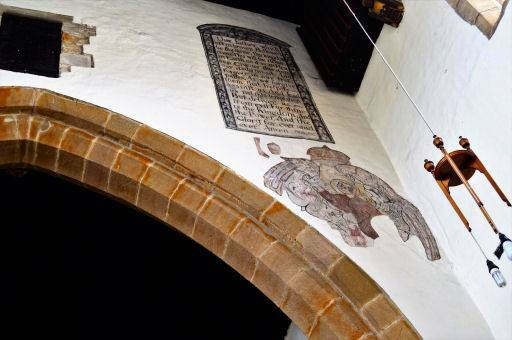 There is also a fragment of a medieval painting above the chancel arch, depicting a fourteenth century representation the Angel of the Annunciation and the remains of some Elizabethan over-painting. A plaque in the building commemorates previous landlords of Bedale, featuring coats of arms of Fitzalan, Stapleton, Grey of Rotherfield (related to Lady Jane Grey), Sheffield, de Warrene (Earl of Surrey), Brian de Thornhill, Lawrence de Thornhill, Richard, 1st Earl of Cornwall, Henry, 3rd Earl of Lancaster, Fitz Hugh of Tanfield, John of Brittany, Earl of Richmond, Marmion, Arthur III, Duke of Brittany and Ascough/Aiskew. There is also a Viking grave marker, which is notable for its depiction of the legend of Wayland the Smith, a legendary master blacksmith mentioned in the Old Norse sagas. 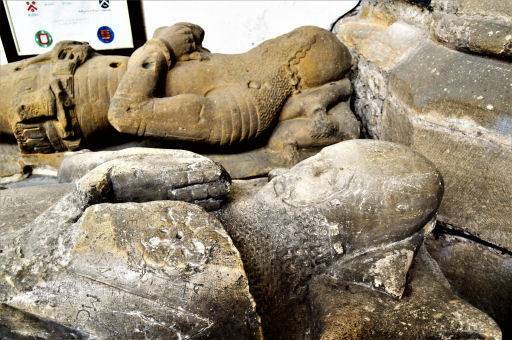 The stone effigy of Brian Fitzalan, (1243 - 1306) Lord of the Manor of Bedale and his first wife Lady Muriel Fitzalan is also to be found in the church. Brian Fitzalan was brother-in-law to King John Balliol of Scotland and a close friend of King Edward I, he was also the Custodian of Scotland. FitzAlan fought against the famed William Wallace at the Battle of Falkirk on 22 July 1298, and was present at the siege of Caverlock in July 1300.The effigy is of magnesium limestone from Tadcaster with chain mail, cross legged, carrying a pointed shield bearing his arms. Traces of paint were found during restoration work in 2000. 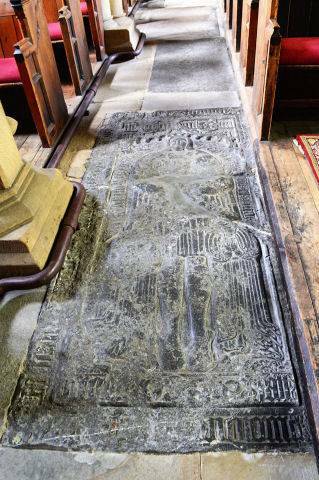 In the floor of the north aisle is a large, rectangular monument, elaborately carved in relief from marble and commemorating Thomas Jackson, who died in 1529. The Pulpit dating from 1908 is richly carved with scenes from the life of St Gregory, whilst the Reredos in St George's chapel is elaborately carved with the six saints connected with the spread of Christianity to the Northern tribes. 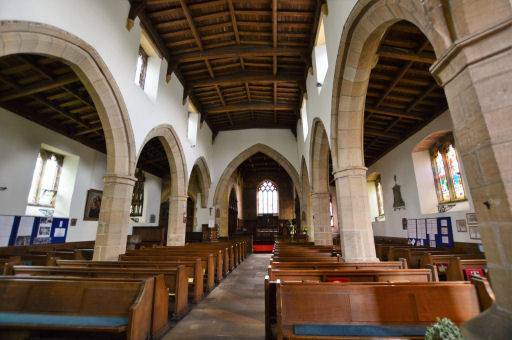 In the chancel are highly decorative fourteenth century sedilia with crocketed finials above each canopy. Furnishings in the choir are by Robert Thompson, the famous 'Mouseman of Kilburn'. There are also some fine sixteenth -seventeenth century Dutch and Flemish wood carvings behind the altar. 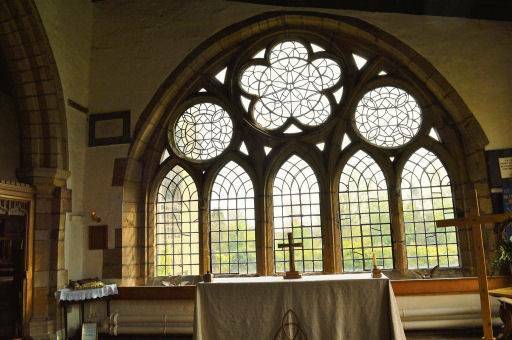 The huge east window of the south aisle may have been moved to the church from nearby Jervaulx Abbey.